McCain is one of many neocon lunatics infesting Washington. He chairs the Senate Armed Services Committee. He has considerable influence over US defense policy. He wants war on Iran. He opposes resolving issues over its well-known peaceful nuclear program responsibly. He issued a lengthy statement on Lausanne talks full of Big Lies. “…Congress…recognize(s) the threat of the Iranian nuclear program,” he blustered. Fact: The whole world knows Iran’s nuclear program is peaceful. Fact: It has no military component. Fact: Annual US intelligence assessments say so. Fact: McCain knows it. He has access to US intelligence on Iran and other countries. Fact: He wants S. 269 legislation enacted – imposing more lawless sanctions on Iran on top of existing ones. Fact: He wants confrontation with Tehran – not responsible resolution of longstanding differences. He urges Israel to “go rogue.” He supports bombing Iran – preemptively attacking a nonbelligerent country threatening no one. Endangering millions of Iranians. Maybe incinerating them with Israeli nuclear weapons. 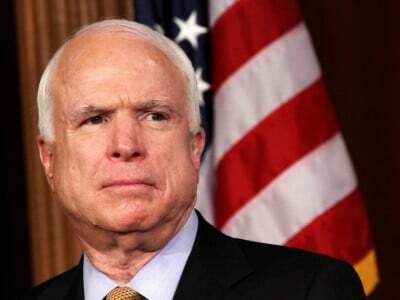 “The Israelis need to chart their own path of resistance,” McCain blustered. He and numerous other hardline senators from both parties back Senate Res. 65. One analyst calls it a “Backdoor to War” bill. McCain, likeminded congressional lunatics and former US officials like John Bolton support bombing Iran. Imperial US policy and Israeli interests matter more than fundamental rule of law principles, humanitarian ones and common sense. Attacking Iran risks setting the whole region ablaze. Washington already is doing it one country after another. Iran has been on America’s target list for years. Whether war ahead follows remains to be seen. Washington reserves the right to use preemptive military force against any nation for any reason or none at all. On Tuesday, Defense Secretary Ashton Carter said “(t)he military option certainly will remain on the table” against Iran – even if Lausanne talks achieve resolution on its nuclear program. Longstanding US policy calls for regime change – including by war if other methods fail. Final resolution remains elusive – even for a framework agreement ahead of hoped for final resolution by June 30. After years of failure, key is whether resolving issues over Iran’s nuclear program changes anything. Hegemons don’t compromise. America is all take and no give. Longstanding US policy calls for regime change. Washington wants pro-Western stooge government replacing sovereign Iranian independence. As long as this policy holds, normal relations with Iran remain impossible. Eventual confrontation looms. It’s likely just a matter of time. Intelligence Minister Yuval Steinitz is one of many influential hardline Israeli lunatics. On Wednesday, he warned of a nonexistent Iranian threat. Saying Israel will counter it militarily if necessary. “(T)he military option is on the table,” he stressed. Attacking Iran means all bets are off. Regional war could follow. Maybe Israeli lunatics will reveal their nuclear strength by using it. Millions of Iranian lives are at stake.